I hope you’ll find this Weekly Update fun and exciting. We are continuing to move forward on all fronts. I also hope to have more surprises for you in the months to come. 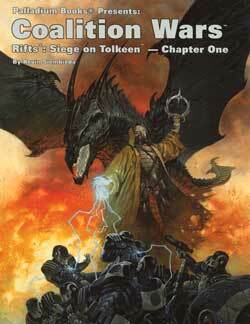 Rifts® Black Market Hardcover – “Gold Contraband” Edition – Available now! No, your eyes are not deceiving you. 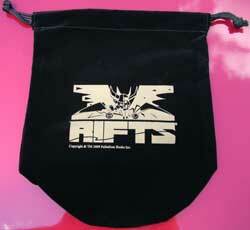 I had a few hundred copies of Rifts® Black Market secretly printed as a very limited, Gold Hardcover Edition. A little item Matthew Clements dubbed the “Gold Contraband Edition.” I told nary a soul. Even the Palladium staff and contributing writers didn't know until I made the reveal this week. I wanted to surprise everybody. Only Wayne Smith was in on the secret. I thought it would be something fun to do. There are a certain number of Palladium gamers who want hardcover editions and collectors who love the Limited Gold Editions, so I thought this was the perfect product to satisfy both. I didn’t want to announce it until we had the books in our hands, they were all signed by everybody and ready to ship (8 signatures including authors Matthew Clements, Carmen Bellaire, and me, plus Chuck Walton and the Palladium staff). 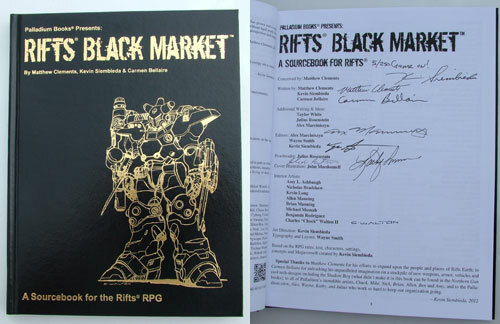 Rifts® Black Market HC is limited to 250 signed and numbered copies. That is the lowest number ever printed of a Gold Edition. Rifts® Machinations of Doom was our previous low number record holder at 400 copies, and, if I recall correctly, all but a handful sold out in a matter of months. 250 copies, 8 signatures and an awesome cover for $60. Order yours before they are all gone. Sold on a first come, first served basis, in the sequence by which they are ordered. And it looks gorgeous. This week started strong before weakening as the week went on, but for September, sales were not bad. Not bad at all. It is another excellent issue and coming along nicely. All the artwork has been assigned and Wayne is busy on final edits. I will be sending out contracts in a couple of days. This book is morphing as I write it and contributors like Matthew Clements and Chris Kluge supply me with new ideas and text for my consideration. It’s all excellent, but I can only add so much. I don’t want to expand the book in size. Meanwhile, all or most of the artwork is in and it is excellent. 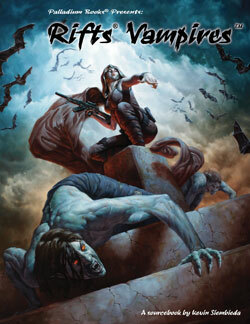 As soon as I’m done working on Robotech® Genesis Pits Sourcebook I’m all over Vampires! I’ve made some major moves regarding the Robotech® line. I had an exciting and fruitful discussion with the key person who we’ll probably be partnering up with on producing Robotech® RPG game pieces and a Robotech® Tactical Role-Playing Game. I can’t reveal details yet, but I can tell you we are extremely excited, and things should start moving fast now. Robotech® fans should go wild when I can start revealing details in a month or two. I’m still working on edits and tweaks of the Robotech® Genesis Pits Sourcebook, namely because my attention has been pulled away to deal with a number of other promising business matters. I should be done with it in a couple of days. 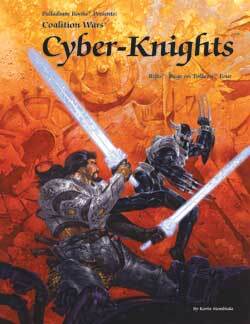 It is another great book, packed with useful and fun source material, new insight, tables and adventure ideas. 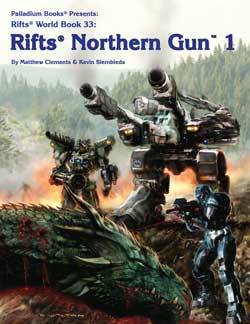 Chuck Walton is coming by this evening to drop off some finished Northern Gun artwork and sign the 250 Rifts® Black Market hardcover books. As I stated last week, I want all six books promised to be out by the end of the year, to actually come out by the end of the year. And that includes Rifts® Megaverse® in Flames. I will continue to assign art for this world-changing tome and can hardly wait till I’m in the saddle editing and tweaking it. 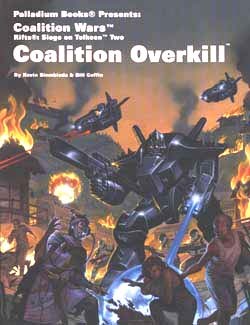 This is an epic book that will provide ample new avenues of adventure and change the face of Rifts Earth and the Coalition States! I have not yet determined what’s coming back into print next. 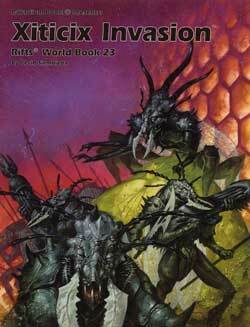 Likely candidates are Rifts® Aftermath, Rifts® China Two, and I’m considering The Rifter® #50. 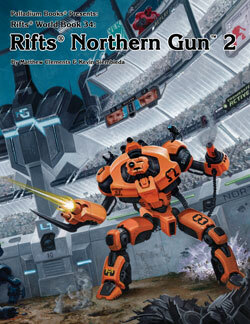 Even though The Rifter® #50 is available as a PDF from DriveThruRPG.com, we get regular requests for it from fans. Alex and I will keep Palladium collectibles stocked in my online store as best we can. I have fewer Rifts® Lemuria Emerald Editions left than I thought (other than a few in the Palladium archives, I think there are a total of 4 earmarked for the store). Other items such as the Rifts® Machinations of Doom Gold hardcover, Rifts® RPG Silver hardcovers, BTS Gold, Rifts® Ultimate Gold, Erick Wujcik’s Amberzine #11, etc. are also in short supply. In most cases, I have only a dozen or less to offer. That’s why we continue to dole them out one at a time. Once they are sold out, of course, they are GONE! Other collectibles include first printings of books, signed books, “proofreader” copies of books (a couple more coming your way soon), original artwork, and other collectible odds and ends. 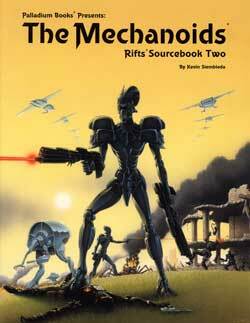 Palladium Books, me and/or some of the guys are participating in a number of upcoming game events. Several of which are taking place over the next 8 weeks. Please check out the Palladium Convention Calendar at the end of this Weekly Update for details. That said, there is one unique event happening this Saturday that I want our local fans to know about. It is called BarbeCon 2012 and sounds truly unique and fun. Julius Rosenstein will be manning the Palladium dealer’s table with core titles and recent releases. Wayne Smith will be showing up in the afternoon, though he’s going there for the food as much as any other reason. Food, you ask? Yes, BarbeCon will be offering BBQ from two, local, Clarkston, “award winning” barbecue restaurants. How cool is that? Palladium pal and Game Master, Bill Korsak, and his associate, Bill Lonskey, are the event coordinators and they and others will be running a host of games – card games, role-playing games, board games and more. Plus they are promising surprise guests and fun, fun, fun. This is the event’s first year and based on advance ticket sales ($20 if you order in advance. $25 at the event. All games and events are included for the price of admisison. BBQ is an additional cost. ), they are expecting 100-200 people. Good luck and great success guys. Another week has zoomed by. When I wasn’t writing one thing or another, I’ve been coordinating the signing and final prep for the Rifts® Black Market Gold Contraband Hardcover Edition (it takes time signing 250 books), coordinating everyone coming in to sign, going back to number them and juggling 20 other things, including convention appearances and various business matters. I made several telephone calls and had numerous email exchanges with Palladium freelancers and my agents at Surge Licensing. There’s nothing solid yet, but some things are at a boil. Unfortunately, all of it takes time. I’m continuing to try to post daily Murmurs from the Megaverse® and Facebook comments. Some are short, others long. I hope all of the are interesting. People seem to be enjoying them quite a bit, so I will continue to post as frequently as possible. Enjoy the Rifts® Black Market Gold Contraband Edition, have a good weekend and keep those imaginations burning bright. Unknown to most humans, deep within Mexico the vampires have established entire kingdoms. There they live like tyrants and gods, dominating an underclass of cattle people used as slaves and food stock. Learn more about the vampires, their rivals, allies and the humans who willingly serve their supernatural masters for a chance to join the undead. A must-have guide for those who wish to travel deeper into the Vampire Kingdoms or play as vampires and their human minions. In final production right now with art and text coming in and final editing and writing restarting next week. 128 pages – $16.95 – Cat. No. 884. An October release. 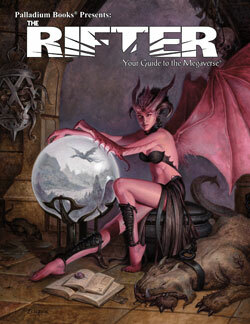 The Rifter® Number 60 is an action-packed issue that delves into adventure, magic, monsters and strange war machines. In production right now. The Rifter® is an idea factory. The key to unlocking the unlimited resources of the imagination for numerous Palladium RPG world settings. It helps players and Game Masters to generate new ideas and keep their games fresh, and provides useful, ready to go, source material that gamers can just drop into their ongoing games. 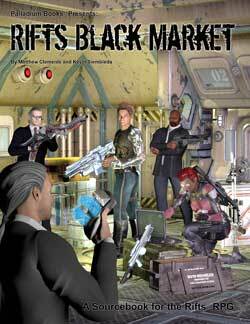 Rifts® Black Market – Trust and Intimidate: A Way of Life, by Liam Gray. Rifts® Sorcerer’s Forge – Timothy Dorman presents a secret community of Techno-Wizards and their unique TW weapons, power armor and gear, as well as details about the place and some interesting inhabitants. Splicers® – Kris Tipping presents House Pandorum and a host of new Splicers weapons, armor, mutants and monsters. Heroes Unlimited – Adventure by Thomas Morrison. Modern Horror Short Story – J.V. Adams spins a tale of intrigue and mystery. All settings – Gaming with Children by Hendrik Harterich. News, coming attractions, and more. John Zeleznik cover. 96 pages – still only $11.95 retail – Cat. No. 160. October release. An in-depth look at the Invid Genesis Pits, their purpose, function and the creatures they create. Many, many avenues of adventure and ideas to spice up your Robotech® campaign with unexpected menaces and intrigue. In production right now! 160 pages – $20.95 retail – Cat. No. 887 – October or November release. 160 pages – $20.95 retail – Cat. No. 888 – November release. 192 pages – $24.95 retail – Cat. No. 876. A December release. 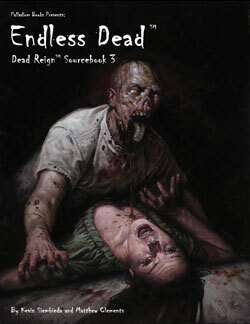 7 new types of weird zombie amalgamations, plus variations. The Military. An expansive section on the military and their response to the Zombie Apocalypse. Vehicle stats, rules and tables for turning cars into anti-zombie defenses. Many random generation tables and encounters. Creating survivor caravans, hideouts, Safe Havens and Death Cults. Over the next eight weeks, Palladium and various staff members will be making appearances and selling product at various gaming events. We sent out a special email early this week to let folks know about some of these events, but here’s a more complete listing. Come on over and join the fun. Palladium pal and Game Master, Bill Korsak, and his associate, Bill Lonskey, are hosting the first ever Gaming Convention and Barbeque (that we know of). And not just any barbeque. The event is being catered by two local, award winning barbeque restaurants! Yummo. 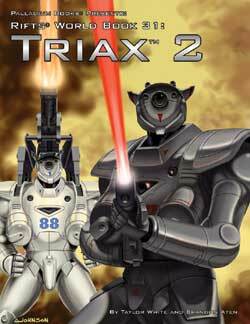 ● Palladium Books will be there with a table and core RPG books and recent releases. ● Wayne Smith will be there. ● Julius Rosenstein will be there. ● I have another commitment that day, but I might try to make it out to BarbeCon for a couple of hours, too. BarbeCon combines all of the fun elements of a traditional 1-day convention with amazing catered barbecue, the amenities of a stunning park backdrop, the exacting event planning precision of a seasoned professional and a few surprises. Board games, card games, role-playing games, miniature games and surprise guests take place under two large tents – rain or shine – this Saturday, September 15, 2012. They are looking forward to providing all attendees with a truly memorable experience. Additional details on BarbeCon can be found at www.quintecons.com. Admission is $20.00 in advance. Includes ALL events. $20.00 for Adults in advance, $25.00 day-of. $17.00 for Children 12 and under in advance, $22.00 day of. This is a retailer trade show sponsored by Palladium’s largest distributor, Alliance. We’ll only be onsite Saturday in the Exhibit Hall to chat with retailers, tell them about upcoming releases and sign autographs. Wayne Smith and I (Kevin Siembieda) will be manning the booth. It’s always a worthwhile experience. 10:00 A.M to 11:00 P.M.
Julius Rosenstein and Palladium pal and G.M., Jim Cross, will be running Palladium gaming events. Jim is also the convention organizer. There will be all kinds of fun gaming events. I’m sure I’ll pop in at least briefly considering its just down the road from the Palladium Office. This a rapidly exploding anime convention that could have 15,000+ people this year. It includes a wide range of amazing costumes, guests, events, cosplay, gaming and multi-media fun. Palladium Books will be exhibiting in the dealers’ room and we’ll have members of the Palladium staff and other maniacs at the booth, including me (Kevin Siembieda), Wayne Smith, Alex Marciniszyn, Julius Rosenstein, Chuck Walton and maybe a few other Palladium madmen. Artist Ben Rodriguez will be there too, but he’ll have his own booth. It all happens at Cobo Hall, downtown Detroit, near the waterfront. Join the fun.